Grace Lee Boggs on Malcolm X: “He Was a Person Always Searching to Transform Himself” | Democracy Now! activist, author and philosopher based in Detroit. Her latest book is The Next American Revolution: Sustainable Activism for the Twenty-First Century. She wrote the book with Scott Kurashige. In 2008, the legendary Detroit-based activist and philosopher Grace Lee Boggs joined Democracy Now! for an extended interview. In this never-aired excerpt, Boggs, who will turn 100 in June, talks about how she knew Malcolm X and how he influenced her. AMY GOODMAN: Can you talk about your experiences with Malcolm X? GRACE LEE BOGGS: Well, I first met Malcolm through his brother Wilfred. One of the first mosques is in—in fact, the mosque number one, I think, is in Detroit. And my sense of Malcolm and of the movement, I think, is very different from that of many people, partly because I thought of Mr. Muhammad not so much in terms of his bizarre concepts, but as someone who, like many Muslims, I think, today, have a sense of themselves as part of another development, that is not Western development, that there must be another way. And I heard Mr. Muhammad, you know, head of the Nation of Islam, make some of these speeches. I heard—I met Wilfred, Malcolm’s brother, for the first time. I began to host meetings at my home where he could talk to people and give them a sense that—most people think of the black movement in the ’60s mainly as a struggle for white rights, but for Muslims, for people who joined the Nation, it was a question of creating our own identity. It was more a part of the identity movements of the ’60s than it was just a rights movement. And I wanted folks to understand that. And so, I began working with Malcolm. I was one of the organizers of the Grassroots Leadership Conference, where he made his famous speech. GRACE LEE BOGGS: In Detroit. AMY GOODMAN: That speech being? AMY GOODMAN: “Prospects for Freedom”? GRACE LEE BOGGS: —was made on November 10th, 1963, a few weeks prior to the assassination of JFK, at which he made his remark, “The chickens have come home to roost,” which led to his suspension by Mr. Muhammad. And then, after he left the—after he actually left, forced out of the Nation, he was looking for what he should do. A group of us came here to New York to meet with him and asked him to come to Detroit to work with us, because we understood Malcolm’s hunger for new ideas, that he was a person always searching to transform himself. And so we met with him and asked him, and he said no, that he was going to be an evangelist, and he could not become an organizer with us. AMY GOODMAN: What do you mean an evangelist? GRACE LEE BOGGS: He felt that his voice was what needed to be heard. And so, he made the Hajj, and he made this enormous discovery that it’s not a question of your biology, that there are people of all races who are part of this sort of humanist journey that we’re making. And he came back to this country, and he said—I think most people don’t know that—he said, “I’m a revolutionary, and I’m a Muslim. That’s all I know about myself. Where I’m going to go, what ideology I’m going to develop, I don’t know. But I must crawl before I walk, I must walk before I run, and I don’t think I’ll have time.” This was in November or December of 1964. He was killed on February 21st, 1965. So we’ll never know what Malcolm would have become. He was a person, as all of us are, in the process of transformation. AMY GOODMAN: How would you describe him, knowing him, meeting him, his personality? What struck you about him? GRACE LEE BOGGS: He was one of the gentlest people I’ve ever met. People don’t know that. I can remember, after he was assassinated, attending a meeting, and I remember young people getting up and saying Malcolm stands for “by all means necessary.” They had taken that little bit of him and made it him. Which isn’t true. I mean, it’s not true of any of us, obviously, but it was particularly not true of Malcolm. And I think people who read the autobiography, to this day, understand that he was in the process of transformation. And I think that’s one of the most important qualities of a revolutionary, to be transforming yourself, to be expanding your humanity as events challenge you. AMY GOODMAN: And, Grace Lee Boggs, what was your understanding at the time of who murdered Malcolm X? In fact, where were you in February when he was gunned down? GRACE LEE BOGGS: On February 21st, 1965, it was a very snowy day in Detroit. I was picketing the church of Reverend Shoulders, who had said that militant blacks—he had made some terrible remarks about militancy among blacks. So we came back from the picketing, my husband Jimmy and I, and I got a call from Pat Robinson in New York that Malcolm had been assassinated. And we didn’t know who it was. We were not ready to attribute the murder to the Nation. So we tried to convene an international tribunal that would include Bertrand Russell and Jean-Paul Sartre. We thought there needed to be an investigation. 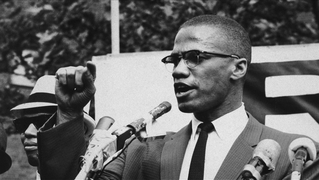 It was very hard at that point, when black unity seemed the answer to so many of our issues, to think of something such disastrous happening inside the black community, that could actually have been—at the moment, at that time, we did not know that Malcolm, because of the conduct of Mr. Muhammad, had already switched from him in his heart. AMY GOODMAN: And how would you compare what Malcolm X represented to Dr. King? You hadn’t personally met Dr. King, but you were certainly living between these two tendencies, movements. GRACE LEE BOGGS: Well, in Detroit we thought King was a little naive. We were very—I mean, Detroit is made up of many people who have come from the South. So we were very happy—we welcomed the Montgomery march. We felt—in fact, it was so interesting. Many blacks who had escaped from the South and come North and had considered that blacks in the South were sort of backward, because they hadn’t done the same thing, began to recognize that something might come from the South rather than from the North. But then, the issues that were facing people in the South were not the same as those that were facing us in the North, and so we had to redefine what was necessary in the North. And we saw the thing not so much as a question of democratic rights and political rights, obviously, but we—particularly for us in Detroit, Detroit was becoming very largely black, and the ruling power, the power structure, the downtown government, the school board, police department, the police chief and all that were still largely white. And we were feeling that we were being occupied by a foreign structure. And so we felt that. So Black Power was not just a thing to arouse people. It wasn’t just a slogan. It wasn’t so much an emotional appeal as it was when it was sounded by Willie Ricks and Stokely Carmichael on the march in Mississippi in 1966. It was more a necessity: We have got to have black people at the head of government, heading the police force, heading the school board in Detroit. And Black Power was a very—it was a very sort of real possibility. We didn’t know how it was going to come about, but because it was a real possibility, a real demand, we were able to test it. We were able to find out, when blacks came to power, that they couldn’t solve the problems. AMY GOODMAN: Did you change your view of King over time? GRACE LEE BOGGS: Oh, tremendously. It was just amazing. I began to read his last speeches, and as the violence—you know, the violence in Detroit began to mushroom after the rebellions of 1967.